She scrambled to find the perfect lead, made sure every comma was in its place, and that her job as editor-in-chief was fulfilled, but behind the stack of papers and computer monitor, she’s just Allison Lamplugh. A human being with a passion for words. Lamplugh is a 33-year-old student who is graduating from LBCC this term with a degree in Journalism and Mass Communication. Being editor-in-chief of the Commuter helped Lamplugh land the job she now has as the social media editor for LB iLearn where she is responsible for managing the Twitter, Linked In, and Facebook accounts for LBCC. Before even attending LBCC, Lamplugh was living an unexpected life of great talent and adventure. Lamplugh grew up in Philomath, Ore. watching her father, Rick Lamplugh, write short stories and books. This is where she developed her adoration for writing. She’d peak over his shoulder to help her father edit his work. She later began to write on her own. She published short stories in elementary school and handed out hand-crafted books made from pieces of paper she had stapled together. She also enjoyed taking scraps of magazines and making “cutout booklets” with the words and pictures. She was an early high school graduate from Philomath at the age of 17. After that, she packed her bags and moved to the Bay Area of California where she was taking college class while working part-time jobs. Juggling the role of both student and employee, Lamplugh chose to work instead of continue school. She lived in the Bay Area for nine years, then decided to move to Hollywood to work and live with friends. After being in Hollywood for about a year, Lamplugh put her writing abilities to the test when a graphic designing friend had the idea of started a magazine. The two were the co-founders of an independent magazine called Bear Witness. Bear Witness interviewed aspiring artists and recording industries. They wrote articles about artists being signed with labels, and got the opportunity to work backstage of live concerts to get the hands on scoop. “That’s when I realized that’s what journalism is about,” said Lamplugh. While the flashing lights and free-spirited Hollywood life-style was thrilling, something was missing for Lamplugh. ”My life felt like a reality TV show,” said Lamplugh. Her boyfriend Lapakka Lee, who she has known since kindergarten, put life into perspective one for her one evening. “When the party is over, and the lights go out, what do you have left?” asked Lee. It clicked. And after living in Hollywood for about nine years, Lamplugh packed up again, and moved back to Oregon to pick up the books and settle down. Knowing that writing was her direction of choice, she began to take classes at LBCC with the goal of a journalism degree in mind. She took the required courses for the program, and immediately got her foot in the door of the Commuter office during a field trip in one of Rob Priewe’s journalism courses. They had asked for anyone that had an interest in working in the office to stick around after class, and she did. The editor in chief at the time was Tejo Pack. He asked her to begin editing the works of current journalists. Her confidence grew with time as well as her respect. After working on the Commuter team for a year as a reporter, Lamplugh wanted to get more experience in the presentation of newspapers. She was elected as the Editor in Chief of the Commuter working alongside the Managing Editor at the time, Chris Trotchie. “The hardest part about working as Managing Editor with Allison was knowing what level of excellence she wanted. Once we raised the bar, she raised her expectations,” said Trotchie. Lamplugh pushed the staff members because she knew they were capable of more. She strived for an environment where people could collaborate and grow through one another’s creativity. “Allison always stood by her writers, designers, comics and artists. When that paper hit the stands, it was her integrity in that rack, not a paper,” said Trotchie. The graphic designer for the Commuter at the time was Nicole Petroccione. She felt that Lamplugh was open minded to people’s needs and fought to make sure the voices of the staff members were heard. “Her and the Managing Editor at the time made an amazing team that I was excited to be a part of,” said Petroccione. Lamplugh has also published some of her work in the Lebanon Daily Post. She worked there as a lifestyles reporter over the summer. 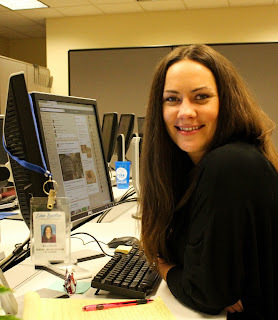 She also works as a copywriter for Ohanie in L.A. where she writes content for websites that they get hired to build. Lamplugh does not lack dedication nor talent, and this is what caught the attention of Stacy Malony, a member of the leadership team for LB iLearn. Lamplugh wrote an article regarding the upbringing of LB iLearn, and Malony directed its success towards the business marketing manager, Jeff Flesch. Flesch and Malony interviewed Lamplugh for the position as the social media editor, and found her as perfect fit. Lamplugh recently pitched a new idea to the board for creating a Facebook chat group specifically for prospective students who would like to inform LB iLearn on the needs that they have as students. This is a new way for a student to quickly express what is meaningful to them as a student, and what they want to receive from their education. “She is just such a great asset to the team,” said Flesch. Lamplugh's background in journalism and writing has given her a head start in her future endeavors in journalism. It is no doubt that she will be sucessful after receiving her diploma for LBCC.Allison’s advice for future journalists emphasized on the importance of listening to their audience. "Take the advice that people give you and find a way to fit their advice into your vision," said Lamplugh. -Allison Lamplugh, 33, from Philomath Ore.